A minimum Digital Group system consisted of a Processor card, an I/O card, and a TV Readout & Cassette card with a motherboard, and power supplies. DG owners could choose from a variety of other cards to complete their systems and perform many tasks. Pictured below are examples of many of the cards that were available from The Digital Group and are part of my collection. I also have several cards manufactured by other vendors both before and after the demise of Digital Group; AEON, TCS, Godbout, & etc. The TCS 32K Memory is the only after market item I am using in any system at the time of this writing, so it is the only one pictured below. This card is used in my Mini-Bytemaster along with the early 32K Static RAM card shown below. I also have several boards that appear to have been "factory" assembled. The boards look to have been wave soldered--all via's are soldered through--and the solder job is consistent throughout the board. They also have inspection stamps on the front or back. Hmmm. Many of the boards shown below have been dusted off, but have not been restored in any way though several are in working condition; they were just the ones that were most accessible for picture taking. I also included multiple versions of the same boards, if I have them. Documentation is available for most of these boards by following the link on the left. I also have pages dedicated to each of the four processors available by clicking the links at the top of the page. * Denotes restored and working condition as shown. This is Digital Groups original video card, the first product offered by the company. 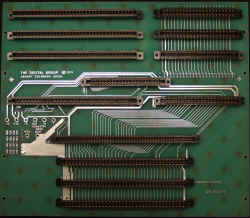 The memory chips are 1101 types (256x1 bits), and the layout is 8 lines by 32 characters. Kind of odd, but hey! It was VIDEO! 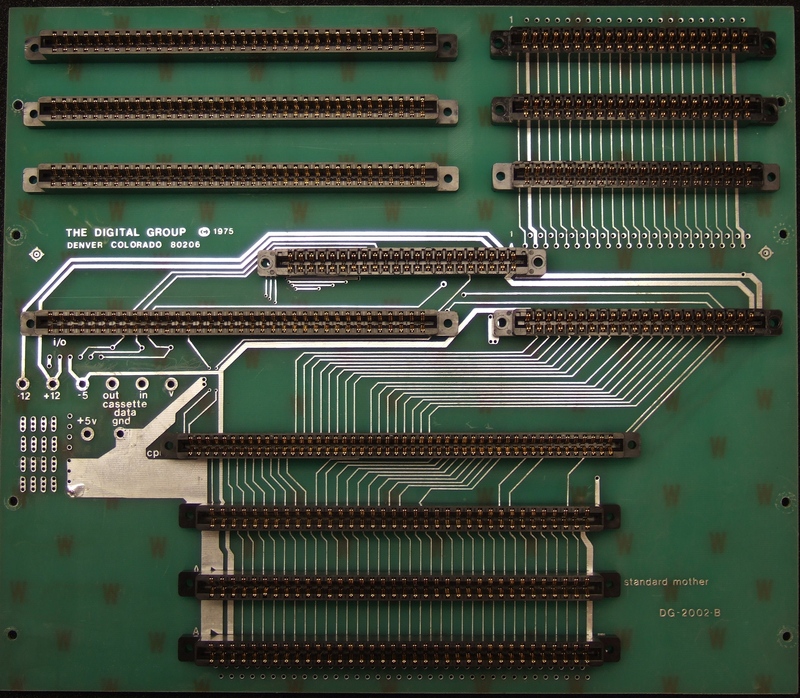 This card was designed for the Mark 8 Minicomputer, and was described in the "8008 packet #1", sold by the digital group starting in the fall of 1974. The packet consisted of software and hardware modifications and improvements to the Mark 8. When I got it, there were about a half dozen missing chips, I spent a bit of time reverse engineering it enough to identify and replace the missing parts before I received a copy of the 8008 packet. The board has been assembled with a keyboard to form a TV Typewriter, and has a page on my web site.